Will the Central Bank of Russia Remain Independent? [Registration Required] Steve Bannon is no longer Strategist in Chief to the President of the United States. Bannon himself told the Weekly Standard “’the Trump Presidency that we fought for, and won, is over.” From which the Weekly Standard concludes “a new phase of the Trump presidency begins.” Maybe not so fast. A cliché is haunting America — the cliché of a second civil war. This is another in the series of NBC radio broadcasts that involved Milton Friedman as one of the three panelists. President Donald Trump's ouster of chief strategist Steve Bannon is unlikely to mark the abandonment of the administration's "America First" agenda that has unnerved investors and trade partners and split the White House into nationalist and globalist camps. We are bombarded with claims that the robots, the AIs, are about to come and steal all human jobs making us entirely redundant. We thus get calls that this requires an entire overturning of human society and golly gosh the government should be doing more. Tim Worstall, referring to my article that I posted on yesterday, makes an important point I should have made. Hoover Institution fellow Henry Miller discusses the following Washington Post article "Babies with a rare, severe form of epilepsy depend on this drug. The maker stopped selling it." As the Syrian regime attacks ISIS near Damascus and US-led coalition forces close in on Raqqa, the region's power dynamics are changing. 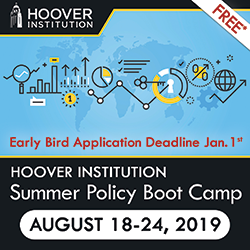 The Hoover Institution is gathering students and recent graduates at Stanford University this month for a week-long program featuring high-profile speakers and experts with the goal of "[teaching] students how to think critically about public policy formulation. In this interview two Hoover Institution fellows, Scott Atlas and Joshua Rauh, discuss the importance of investing in policy education for young people, especially in the era of heightened partisanship, rising populism, and social media. Hoover Institution fellow Richard Epstein discusses the chaos in the Trump administration.